Our 9MM +P+ PENETRATOR 124gr. FMJ-FN has two basic purposes. When I carry a defensive/offensive handgun, I consider that should I be required to shoot another human, if I don't kill him on the first couple shots, he will get behind cover. So, generally speaking, I will load two or three JHP cartridges to be fired first from my magazine, but all cartridges in the magazine after the first few, will be FMJ-FN so if my target is taking refuge behind a stick frame wall or a sofa or a car door, etc, I can shoot through his cover and kill him. JHP bullets may or may not penetrate various types of cover. 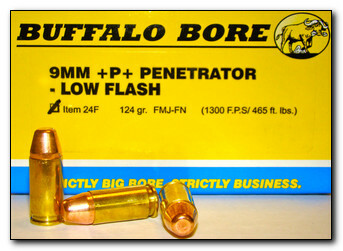 FMJ-FN bullet designs are great for woods carry where a person may need to shoot a bear or other wildlife that requires deep penetration. I often carry a 45 ACP pistol in the woods and when I do the entire magazine and chamber are loaded with FMJ-FN cartridges. Even though I may need my "woods" pistol to fend off a human attacker, I have no hesitation that good flat nosed FMJ style bullets (this includes hard cast bullets) are effective against humans, so I see no disadvantage in carrying non-expanding bullets in my defensive pistols. Flat nosed non-expanding bullets crush their way through flesh and bone. This crushing action keeps them nose forward, so not only do they cause considerable damage, but they stay nose-forward and penetrate straight-line and by staying “straight”, they end up penetrating deep. On the other hand, round nose non-expanding bullets tend to slip and slide through tissues doing little damage along their path. This slipping through tissues also allows the bullet to get somewhat sideways as it penetrates. This causes the bullet to veer in directions other than perfectly forward and this sideways action, limits penetration in varying ways and can certainly destroy straight-line penetration. While it seems counter-intuitive, a bullet with a small flat (meplat) on the nose will not only do much more damage than a round nose bullet, but it will penetrate straight and therefore deeper. Our new 9mm +P+ PENETRATOR FMJ-FN (item # 24F) is a load I came up with for my personal use and which I have carried for many years. I have just recently decided to introduce it to the public because of elevated demand for such a load. It is loaded with flash suppressed powders as are our other 9mm loads. 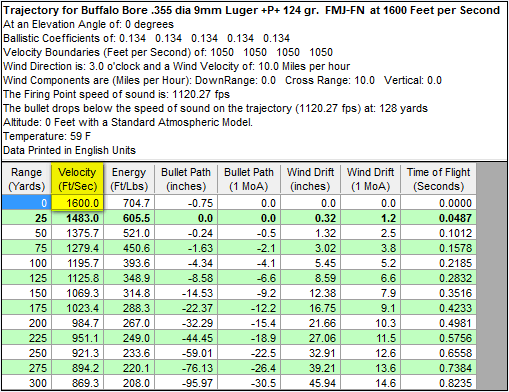 As always, see the below real world velocities taken from my personal pistols, not laboratory test barrels. 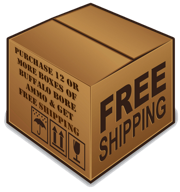 This is my second review of this ammo. I used a different gun, a new SIG P 365. I tested different weight solids and HPs to see what was the most effective. This ammo out-penetrated everything. 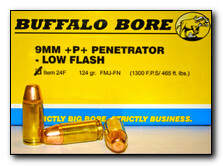 My suggestion for those with sub-compact 9mm guns is to use a combination of Buffalo Bore 124 grain P HP for the first few rounds, and for the remainder of the magazine use 124 grain P solids. They are perfect when used together. Bullets are the same weight, and travel at the same speed. Yes, it may be harder on some guns, but this is EMERGENCY ammo, recoil is very controllable in a 17 oz gun. No excuse NOT to use this ammo. I have been shooting these for quite a few years in my G19 & G17 with 22lb Gen3 RSA w/Gen4 adapters. They did work fine with the stock Gen4 RSA but since the power difference was substantial I just opted to batter the pistols less and use the stronger recoil springs. I tried this round with my G26 with a Tungsten guide rod 22lb RSA and it would not work reliably. I also tried this round with the stock RSA and it would not work reliably. No big deal though, just throwing this out there to save someone else the trouble. The 9mm Outdoorsman works excellent in my G26. Overall very impressed with the power and reliability of the Penetrator round with my G19 &G17. These are my wife's carry loads in her Glock 19 while hiking/fishing in NW WY. She's shooting 2-3 inch groups off-hand at 25 yards and the recoil is very manageable for her. Though she usually carries "bear spray" as well, she's a lot more comfortable with these as "Plan B". No modifications to her Glock, no issues with feeding or lead fouling. I got these for woods carry when I'm hiking. I have the potential of coming across black bear, cougars, wolf's and coyotes. I fired a couple of these from my glock 17 and they kick noticeably harder than regular p ammo. Still very controlable though. As advertised! I got 1300 fps out of my Beretta 92A1 and 1500 fps out of my Beretta CX4 carbine at the range today. I usually get around 1050 and 1250 respectively with typical target ammo. First I'd like to thank everyone at Buffalo Bore for this ammo including the gentleman who's idea it was to begin selling it... When I first purchased my 9mm carbine in 1999 I was young and didn't know much about ballistics... I felt bad as I learned of it's inferior penetrating power in comparison to rifles... While still far from rifle like in penetrating power, this ammo paired with my carbine brings a new joy to experimenting with shooting of various different things, and turns my rifle into a possible 3A vest defeater, if a bad guy's wearing one! I carry a 15-round mag of these in my 9mm SIG on our ranch in central Texas. It really gives an extra layer of security, because out here you never know what you'll run into. It might be a larger animal where greater penetration or a solid head shot is needed - a big feral dog or hog, mountain lion, whatever. I feel a lot safer knowing I have 16 rounds that will blow right through anything I'm likely to encounter.